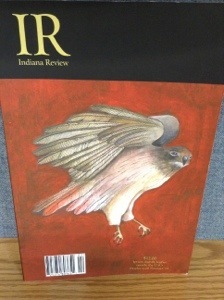 I’m reading the current Indiana Review. I happened upon it after staying in Cincinnati with Linwood Rumney, whose work I’m thrilled to have appear with mine in next week’s issue of Day One, and his wife Jessica Hahn, an amazing poetry-fiction duo I am grateful to have spent time with. On my way out the door with suitcases, Jessica gave me copies of the latest Indiana Review and Missouri Review. I also have a Cincinnati Review in my bag. On the plane to Houston, I started with IR and am blown away. I’ve never read so many stories that thrilled me at once in a magazine. Out of the realist stories, Shannon Hefferman’s “Purple Plus,” Bess Winter’s “Bad” and DJ Thielke’s “Private Dark” all had endings that stayed with me long after the stories finished. Nick White’s uncanny story about a boy sketching teen siamese twins fascinates and glimmers with sorrow. Then the surreal and magical-real stories just blew me away. Daniel Hornsby’s “Giant Mechanical Unicorn, Piloted by Children” is such a beautiful, sad but hopeful dream about childhood. This one will stick with me as one way to write surrealism while still keeping a recognizable plot and such a core of emotion. Helena Bell’s “The Aliens Made of Glass” is about a nun in a pre-apocalyptic earth with aliens soon to land. The story rather prophetically asks, If God was in a box, would you look inside? The other fiction in the issue was top notch. If you can pick up a copy or subscribe, you will be blown away.